Sometimes its fun to have a random lunch party, but you don’t want to spend a lot of time in the kitchen, since that would cut into drinking delicious glasses of wine with your lunch guests. 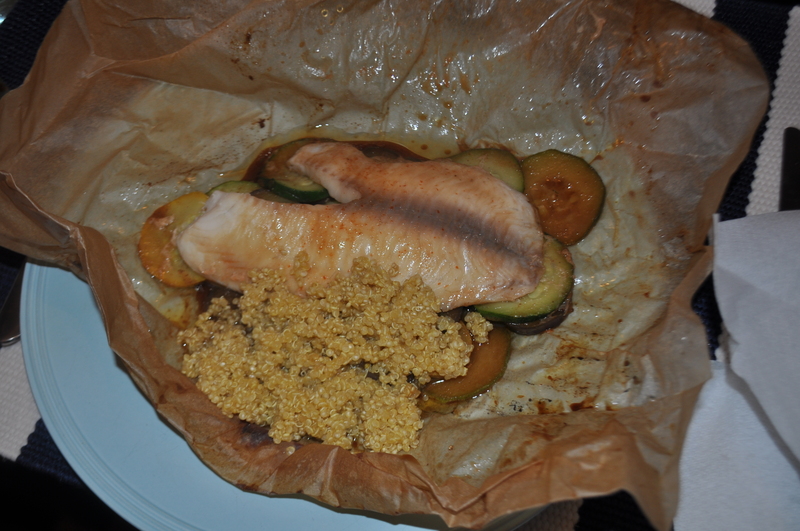 For times like these a lunch in papillote is perfection! 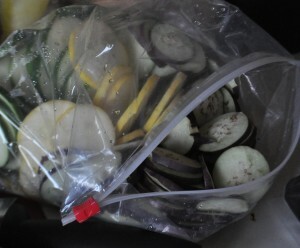 After making the ratatouille last weekend I had a big bag of leftover sliced veggies (I got a wee bit out of control with the mandolin, possibly emboldened by the fact that I managed to avoid cutting my fingers off), I decided they would be perfect to layer under fish in a parchment paper package. 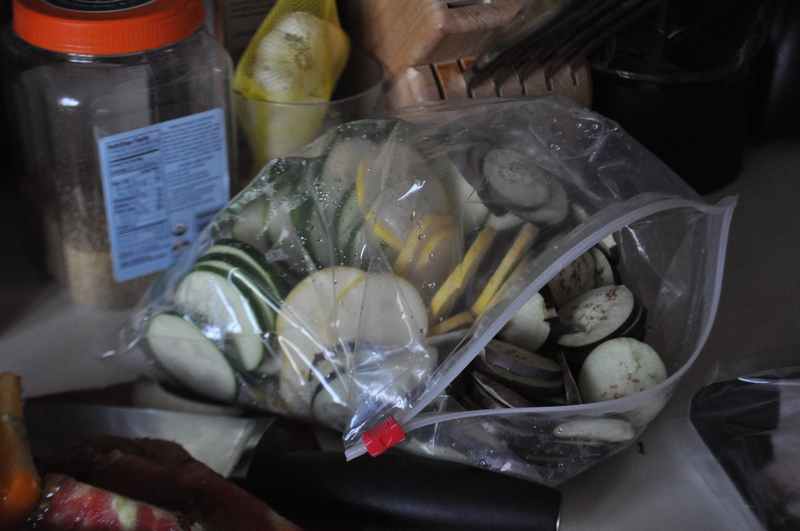 I tossed the eggplant, zucchini, and squash with enough peanut oil to evenly coat the veggies, 3 tablespoons of celery salt, and 3 tablespoons of ginger powder, and let that marinate to let it all soak in. 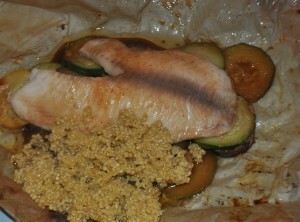 In the meantime I mixed 3 tablespoons of sriacha with just about 1/4 cup of soy sauce, once the veggies were laid out, and the talapia filets on top, I poured the soy mixture over the fish and wrapped up each packet by pulling the long edges together above the fish and rolling it down, then curl the open edges in. I laid the packages with the rolled top flat on a plate to crush it all into place till I was ready to cook. I tossed the packets on a hot grill for 15 minutes, half the time with the lid down, however putting them in the over at 350 for the same amount of time would work as well. I made quinoa with half water and half veggie broth (can’t be stock since there are no bones), then once the packets were cooked and opened on the plate I spooned the quinoa into the packet to absorb all of the lovely juices. For lunch we got all of the flavor without any of the effort of sautéing or braising.